A rash is a noticeable change in the texture or color of the skin. The skin may become itchy, bumpy, chapped, scaly, or otherwise irritated. The term rash has no precise meaning but often is used to refer to a wide variety of skin disorders. In normal conversation, a rash is any inflammatory condition of the skin. The most common bacterial infection of the skin is impetigo. Impetigo is caused by staph or strep germs and is much more common in children than adults. Eruptions caused by bacteria are often pustular (the bumps are topped by pus) or may be plaque-like and quite painful (cellulitis). Again, poor hygiene plays little or no role. Nonprescription antibacterial creams like bacitracin (Neosporin) are not very effective. Oral antibiotics or prescription-strength creams like mupirocin (Bactroban) are usually needed. Itchy patches on the palms can be accompanied by red bumps, pain, scaling of the skin, dryness and the formation of blisters or lesions that are filled with pus. 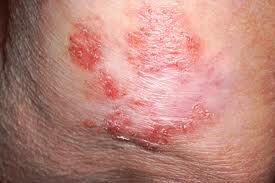 Scabs can also appear on the patchy area of skin. The patches can vary in size, from as small as a dime to more than several inches in diameter. They can also be accompanied by flu-like symptoms such as an achy body, fever and chills. Round patches of skin on the palm can be caused by several conditions.Contact with soaps, jewelry or weeds can create itchy rash-like symptoms on the palms called contact dermatitis. Fungi, such as ringworm, can also result in a round, ring-shaped patch. In addition, ticks and tiny mites can cause round rashes and patchy skin on the hands. Most rashes are not dangerous to a person or people in the vicinity (unless they are part of an infectious disease such as chickenpox). Many rashes last a while and get better on their own. It is therefore not unreasonable to treat symptoms like itchy and/or dry skin for a few days to see whether the condition gets milder and goes away. Nonprescription (over-the-counter) remedies include: anti-itch creams containing camphor, menthol, pramoxine (Itch-X), or diphenhydramine (Benadryl); antihistamines like diphenhydramine, chlortrimeton, or loratadine (Claritin, Claritin RediTabs, Alavert); and moisturizing lotions.